Termites are another pest species that homeowners won’t know much about until they have to deal with them in the house. Soil-feeding creatures in the garden aren’t much concern and may go by unnoticed because of their habits. The problem comes when wood-loving termites decide that the wooden structures in the home look like a tasty, welcoming home for their colony. There are more than 300 species of termites in Australia, classed under sub-groups of subterranean, dry wood eating, damp wood eating, soil-feeding and grass eating. It is usually only the subterranean and dry wood termites we need to be concerned with. Why are termites such a problem in our homes? You may not know much about these species of termites, but you are probably aware of all the stereotypes surrounding termites and wood. Cartoons may exaggerate the problem, but they are still hungry, devastating pests. Those species that live off wood will burrow into suitable habitats and create new colonies. They don’t simply bore into the surface. Instead, they feast on the wood converting the cellulose found within the wood into sugars. This means all the cellulose and starch that holds the wood together slowly get eaten. This is a structural nightmare in a home, as this can damage the integrity of the wood. This, in turn, puts the structural elements of the home, and furniture, at risk. What can we do to control termite numbers in our homes? The problem with termites is that we may not realise that we have them deep in the structural parts of the home until we see the severe damage, or spot an individual running across a floor or other surface. The other issue here is that it is easy to create an inviting environment for them to live in. They like a warm, humid environment where there is plenty of moisture in the wood to sustain them. They will, therefore, suffer in drier conditions. However, this can be difficult to create in some Australian homes. Some species don’t need an external water source if the wood is moist enough. You also have to question how they getting into the building. Some can easily make their way in on the ground floor if there is enough moisture and they can easily travel from the soil. Look out for potential entry points. Call in the pros at Sunnystate Pest Control to deal with your Termite issue. You may have an idea that there are termites in your home, but you will also realise that it is very unlikely that you will be able to handle the project alone. If you believe that you have an infestation, you need to call a professional for an inspection. 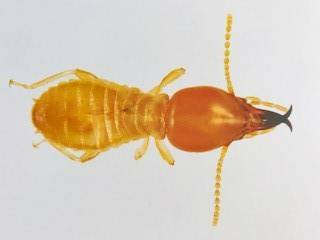 The experts at Sunnystate Pest Control are skilled in termite identification and can determine the worst of the pest species in order to understand their habits and living environment. That is when they get a soldier under a hand lens. From there they know precisely the right course of action to flush out the colony and ensure that you have a termite free home.